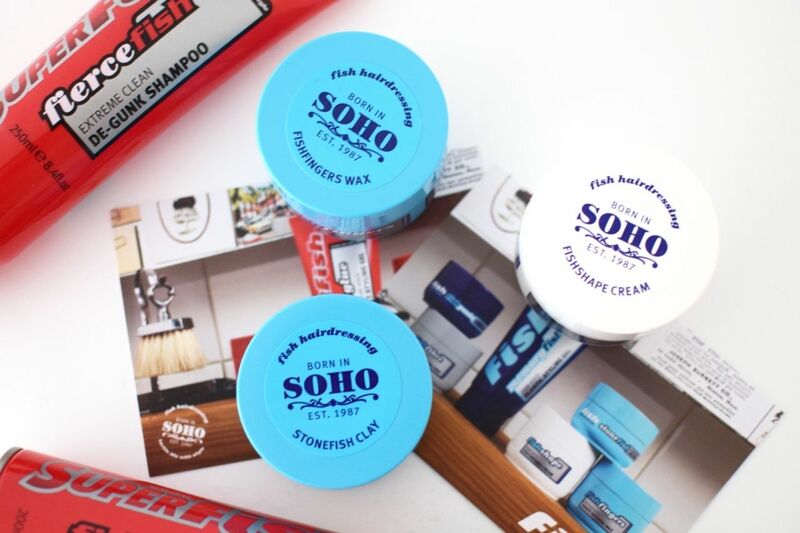 Fish hair products have been around since 2002 and it is one of those ranges where you know you will get a good product for a fair price and it is available across most high street stores. I recently received a mixture of the super fish and fish ranges and after trialling them, I have broken down the products. The stand out product in the range. It is great for all lengths of hair, particularly for the popular mid length hairstyles. The cream is softer than a wax, however holds like a good quality low shine wax without that annoying hard finish. The fishshape cream is re-workable and really flexible and allows you to restyle throughout the day. It can be applied to dry or towel dry hair and a little goes a long way, so you won’t need more than a large pea shape to style even if you have longer styles. Definitely one of the stronger products on the market, the clay is pretty hard when you first rub it in between your fingers, as with most clays it gives your hair a textured look. Stonefish clay is one of those hair products that is a good finishing product, especially if you have dried your hair with a hairdryer and your want your hair to stay in place all day. Fishfinger wax is the classic fish product. The wax is ideal for shorter to mid length styles. As you would expect in a wax it is a firmer product than the fishshape cream and with a medium hold. The fishfinger wax does hold well, especially if you apply it to the roots of your hair to create volume or the wax is also great if you want to add a slight shine to your hair for a precise style or to create a messier look. Something to pay attention to if you do not like a shiner finish is you should apply to dry hair not towel dry hair, as if you do apply to towel dry hair you will get a much higher shine. This is one of the newer products on the market. The fishsticks is a powerful hairspray and definitely lasts all day. The hairspray dries very quickly and is surprisingly not sticky like some other hairsprays. 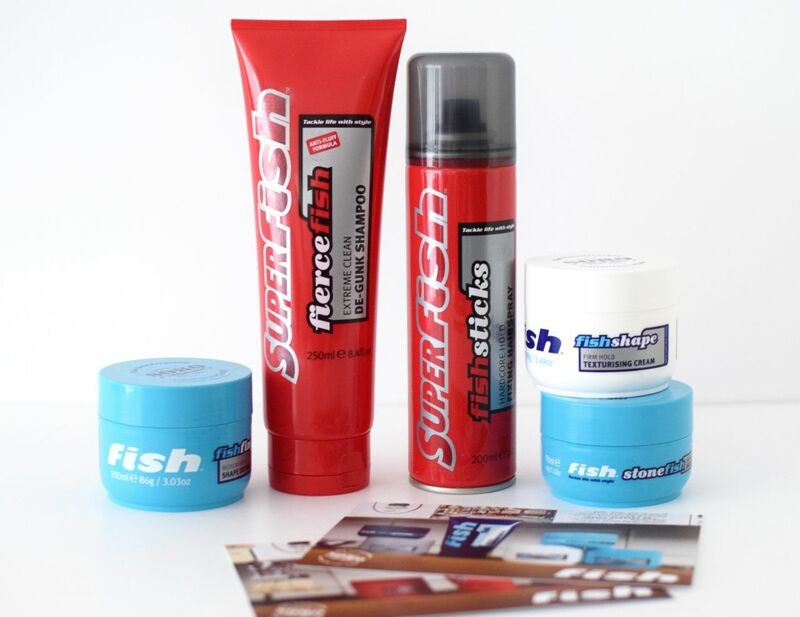 The trick with this hairspray is to use one of the creams and waxes first and then finish off with the fishsticks for all day control and hold. If you have longer hair or struggle to control your quiff and want a natural finish on your hair the fishsticks is definitely the hairspray for you. 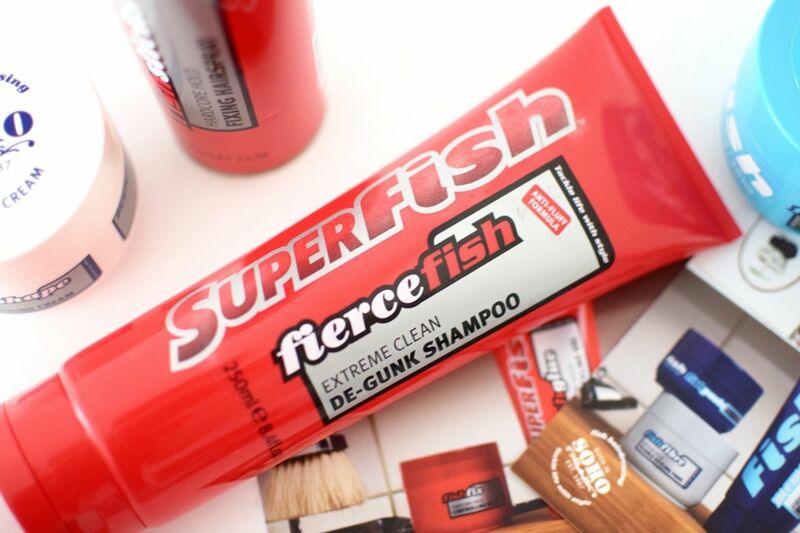 Part of the super fish range (the red range), the fiercefish de-gunk shampoo is designed with an extra strength cleansing formula to help remove all hair products, which is great when you use a lot of styling products everyday. A great thing about the shampoo is the added vitamin E to keep your hair strong and reduce breakage when using some of the harder hair products. Fish Soho have a great range, offering a product for any style. The fishshape texturising cream was my favourite product and although my hair is shorter, finishing it off with the fishsticks hairspray really helped to keep the style and hold for the whole day. Shop the fish hair products range now at Boots.